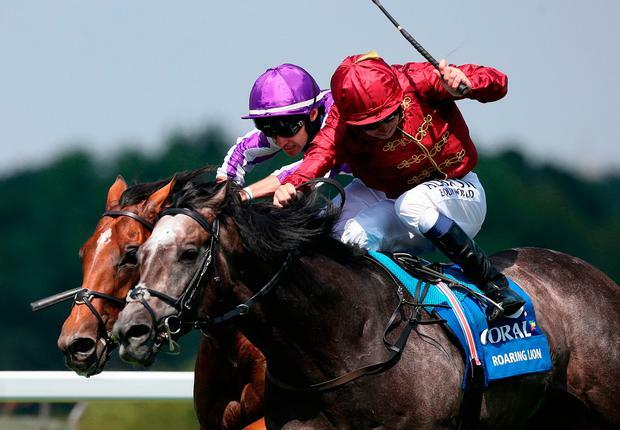 Roaring Lion battled on bravely to beat his old rival Saxon Warrior in the Coral-Eclipse at Sandown. The two classy three-year-olds had the 10-furlong Group One to themselves and no quarter was given in the closing stages. Hawkbill made the running from Forest Ranger, but the older horses had no answer to the younger generation who dominated the finish. Roaring Lion (7/4 favourite), trained by John Gosden, passed the post in front by a neck under Oisin Murphy from Aidan O'Brien's charge ridden by his son, Donnacha. A stewards' inquiry was called as the two protagonists came close in the final strides, but the placings stood. Gosden said: "He rode him beautifully and very coolly. He got too far back, he knew that, and he didn't hurry to get back. It was a very good ride and I'm thrilled. "I thought Saxon Warrior was magnificent, so all credit to Aidan O'Brien." Gosden added: "He ran beyond his trip [in the Derby] and we stood on the Downs right there and then and said 'this horse goes for the Eclipse and comes back to a mile and a quarter'. Others seemed to join us on the idea late. "It was very sad that the Derby winner [Masar, who was ruled out through injury on Friday] wasn't here as it would have been a phenomenal race if you had the Guineas and Derby winners and us. "We will freshen up and go to York (for the Juddmonte International). I'm sure we will see the second there and with some luck, we will see Masar there. That will be some horse race." Murphy said: "Whenever a horse shifts off a line or anything small in a race, the stewards look into it. My horse has caused very little interference, if any, and clearly he was the best horse in the race. He's a very talented colt. "There's a huge team at John Gosden's who deserve big-race success and I'm delighted. I went out in the race with a very open mind and full of confidence thanks to the owner and the trainer. Thankfully, we delivered." O'Brien felt 2000 Guineas winner Saxon Warrior had not suffered too much due to the interference and was thrilled with his performance just a week after finishing third in the Irish Derby. He said: "The head-on looks like they did come together. It was not an advantage as he is a big horse rolling at that time of the race. It was a very good run though and I'm delighted."